- Publisher "For me," says N.T. Wright, "there has been no more stimulating exercise, for the mind, the heart, the imagination and the spirit, than trying to think Paul's thoughts after him and constantly to be stirred up to fresh glimpses of God's ways and purposes with the world and with us strange human creatures." Wright's accessible new volume, built on his Cambridge University Hulsean Lectures of 2004, takes a fresh look at Paul in light of recent understandings of his Jewish roots, his attitude toward the Roman Empire, and his unique reframing of Jewish symbols in relation to his experience of the risen Christ. Then Wright attempts a short systematic account of the main theological contours of Paul's thought and its pertinence for the church today. About "Paul: In Fresh Perspective"
"For me," says N.T. Wright, "there has been no more stimulating exercise, for the mind, the heart, the imagination and the spirit, than trying to think Paul's thoughts after him and constantly to be stirred up to fresh glimpses of God's ways and purposes with the world and with us strange human creatures." 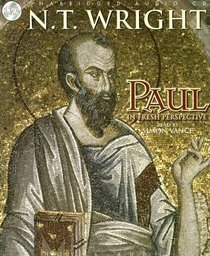 Wright's accessible new volume, built on his Cambridge University Hulsean Lectures of 2004, takes a fresh look at Paul in light of recent understandings of his Jewish roots, his attitude toward the Roman Empire, and his unique reframing of Jewish symbols in relation to his experience of the risen Christ. Then Wright attempts a short systematic account of the main theological contours of Paul's thought and its pertinence for the church today. N.T. (Tom) Wright (D.Phil., University of Oxford) is Reseach Professor in Christian Origins at St Mary's College in the Divinity School of St Andrew's University, Scotalnd. Formerly Bishop of Durham, he was recently named by Christianity Today as one of the top five theologians in the world. Once Canon Theologian of Westminster Abbey and dean of Lichfield Cathedral, he taught New Testament studies for twenty years at Cambridge, McGill and Oxford Universities. Wright's full-scale works The New Testament and the People of God; Jesus and the Victory of God; and The Resurrection of the Son of God are part of a projected six-volume series entitled Christian Origins and the Question of God. Most recently he has released Surprised by Hope; Small Faith--Great God; Virtue Reborn and Justification: God's Plan and Paul's Vision.